Sales Of New Homes Fell In December, But Were Up Sharply In 2012 : The Two-Way There were an estimated 367,000 new homes sold last year, up 19.9 percent from the 306,000 sold in 2011. The dip in December isn't being seen as a sign that the recovery has gone off track. A "sold" sign outside a home under construction last fall in Peoria, Ill. 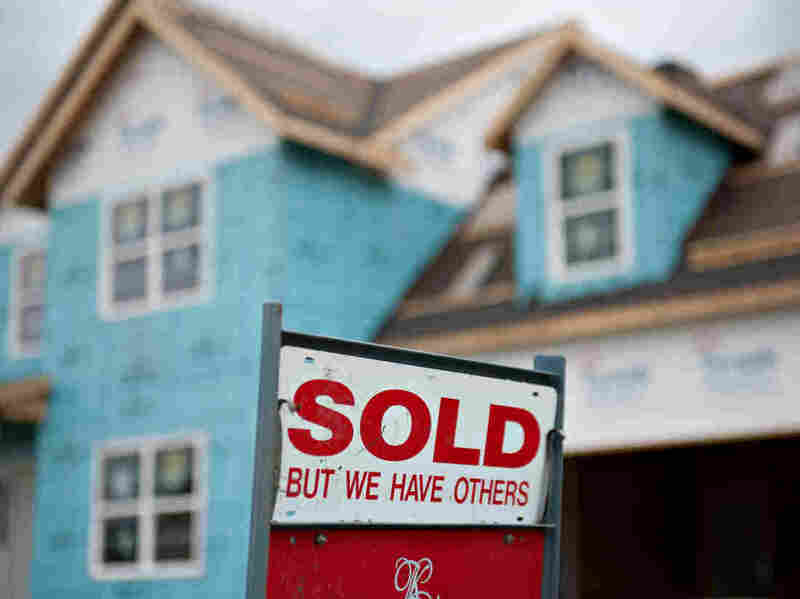 Though there was a 7.3 percent drop in sales of new homes in December from November, sales were up a healthy 8.8 percent from December 2011, the Census Bureau and Department of Housing and Urban Development report. Homes sold at a annual rate of 369,000 last month. Over the whole year, the agencies estimate, there were 367,000 new homes sold — up 19.9 percent from the 306,000 sold in 2011. "Government data for new home sales are subject to substantial revisions. Indeed, the Commerce Department raised its estimate for sales in November by 22,000 to a 398,000-unit rate, making the pace of sales in November the fastest since April 2010."